Local acupuncture clinic Acupuncture That Works Ltd, have been awarded Acupuncture Clinic of the Year 2019 in the Alternative Medicine & Holistic Health Awards, hosted by GHP Magazine. The clinics’, owned and managed by Emma Guy, have been recognised by Global Health & Pharma for going above and beyond for their patients and customers, striving to offer relief and reassurance, in places where more traditional medicine cannot. Acupuncture That Works is one of the fastest growing acupuncture brands in the U.K., comprised of a dedicated team of experts with clinics based in Northwich, Winsford and Chester. Managing Director Emma Guy discovered acupuncture after a short period of illness and fell in love with Traditional Chinese Medicine after finding that it benefitted her so much. Emma decided that she wanted to help others, so changed careers and retrained as an acupuncturist before starting her business, which is now supported by a hardworking, dedicated team. 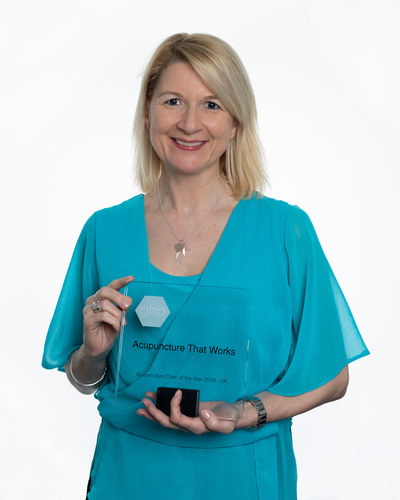 Their commitment to acupuncture has been recognised by GHP Magazine, a merit-led awarding body, who say that only the most deserving individuals walk away with the prize. GHP recognise businesses and practitioners from across the globe, who want to prove and demonstrate that antibiotics and chemicals are not the only options available when trying to improve your health and treat or manage certain ailments. As consumers become increasingly concerned about the negative effects of more traditional medicines, some are choosing to switch to alternative therapies such as acupuncture. With nominations for this award category coming from all over the world, winning the prize is a fantastic achievement for Acupuncture That Works and its team of eleven therapists, based in clinics across the North West. Acupuncture That Works supports patients who arrive at their clinic, with a range of therapies including Acupuncture, Physiotherapy, Reflexology, Hypnotherapy, Reiki and Massage. Whilst the clinic makes no guarantee that their solution will provide a cure, they as a team, have the experience and expertise to help a variety of conditions with acupuncture and other therapies and work alongside their patients to provide short term relief in some form. This press release was distributed by ResponseSource Press Release Wire on behalf of Acupuncture That Works in the following categories: Health, Women's Interest & Beauty, Medical & Pharmaceutical, for more information visit https://pressreleasewire.responsesource.com/about.